Mucus is a common phenomenon of having a cold or chest infection. While mucus can be gross, it actually is important because it protects the surfaces of mucus-making tissues, like those in the nose, sinuses, mouth, lungs, throat and GI tract, so that the tissue doesn't dry out. Mucus can have many different colors, including clear, yellow, green or brown. 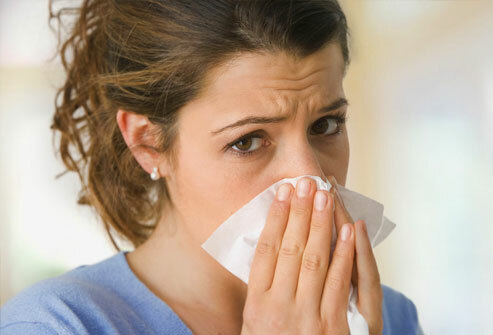 If you are coughing up brown mucus, you should take note of that as it could mean you have more than a simple cold. Coughing up Brown Mucus, Why? Coughing up brown mucus can just mean you are a smoker. The regular inhalation of smoke from tobacco products means you are inhaling certain resins, chemicals and tar. These substances get stuck in the lungs and, when you cough, you will be coughing up brown mucus. It is a way of having the lungs clear up what has become trapped within it. This kind of mucus usually coughs up during the morning hours and is a normal phenomenon. It especially worsens after you are trying to quit smoking because the lung cilia liven up and try to clear out the mucus that has built up over the years when you smoked. Those of you who must live in polluted environments may also be coughing up brown mucus because there are pollutants, including dirt and dust, building up in the throat and lungs. A major function of mucus is filtering out the air we breathe in. It traps dust particles and other pollutants that make the mucus appear brown when you cough it up. This can last as long as you are exposed to the pollutant. If you eat particular foods, you can cough up brown mucus. These include chocolate, coffee, tea, red wine and dark sodas that will make your mucus look brown. Eating a lot of garlic will also lead to coughing up brown mucus. If you suffer from certain types of lung infections, you may be coughing up brown mucus. The mucus in the lungs is designed to trap bacteria and viruses and when you cough it up, it can be discolored. Brown mucus is especially common in chronic bronchitis of the lungs but can be seen in lung cancer and emphysema. If you are consistently coughing up brown mucus, you should see a doctor to identify the possible reasons behind the brown coloration of the mucus. It may be something in the lungs but can also occur if you have a case of infected sinuses. This is not a serious condition and the mucus should have a color of dried blood. Nasal polyps can irritate the sinuses and nasal cavity, and commonly lead to nose bleeding. So when the blood dries, it can look brown in color. Alcohol abuse can make it more likely that you will suffer from various kinds of upper respiratory infections, including infections of the throat and lungs. Coughing up brown mucus is common in alcoholics, especially those that consume alcoholic beverages that are also brown in color. There are ways you can come to cope with coughing up brown mucus. The following are some common things you can do to reduce the amount of brown mucus in your respiratory tract. Sudafed or any good decongestant in pill form or as a nasal spray can cut down on mucus production so you will have drier mucus membranes and less mucus. Expectorants such as guaifenesin will loosen up the mucus in your throat and lungs but don't suppress the cough. They just make the mucus thinner so it is easier to cough up when you are coughing. Robitussin and Mucinex are good expectorants to choose from. You should avoid the cough suppressants sometimes seen in combination expectorant/cough suppressant medications. Cough Suppressants: If you want to avoid coughing altogether, you should take dextromethorphan so you can suppress the cough. Pholcodine is another less commonly used cough suppressant you can use. Cough medicines with codeine will also reduce the coughing. Throat lozenges. You can suppress the tickle in your throat by using throat lozenges. They come in many flavors and will help reduce throat pain and coughing. Antihistamines include medications like diphenhydramine and promethazine. They can dry up the secretions in the respiratory tract so you won't cough up as much mucus. Ipratropium bromide is a nasal spray that lessens the amount of watery nasal secretions that can drip in the back of your throat, reducing the cough. Drink plenty of fluids. This helps the mucus loosen so you can cough it out much easier. Water is the best fluid to drink. Try a natural tea. The warmth of teas will reduce the amount of thick respiratory mucus and will allow you to cough up mucus better. Use honey and pepper. Mix a bit of honey and white pepper into warm water or just eat it off a spoon. This helps dry up mucus and will lessen the cough. Inhale steam. If you have a steamer, put it on and breathe it in. You can have an increase in expectoration if you add eucalyptus leaves or mint leaves to the steamer. It can humidify the air so that you can breathe better. Try Golden Seal. This is an herb you can find in health stores that reduces the congestion and irritation of the lungs. Take it as directed by an herbalist. Try garlic and milk. Mix a clove of minced garlic and put it into milk to help you cough up the thicker mucus within the lungs. In this case, the garlic is used as a natural expectorant. Blend ginger juice into honey and take it twice daily to help deal with coughing up brown mucus. Boil up fresh basil leaves with crushed black pepper and about a tsp. of crushed ginger. Then add a teaspoon of honey. Take this concoction 2-3 times per day to loosen the phlegm in your throat. Quit smoking. It takes more than one year to get rid of mucus from the respiratory tract after quitting smoking. Gargle with salt water. Make a saline solution by mixing a pinch of salt into lukewarm water. Gargle with this solution for a few weeks so that you can loosen the phlegm in your throat. Blow your nose. You should do this every morning to clear out mucus that has built up throughout the night. Avoid refined foods, dairy products, heavy meals and fried food. These foods can change the texture of the mucus you cough up. Eat fruits. Fresh fruits are best when you are coughing up brown mucus from a cold. They have vitamin C that will help you resolve your symptoms faster. Use a neti pot. This is a special device in which you pour saline into one nostril, allowing the fluid and mucus to drain out of the other nostril. Throat Feels Sore Just One Side? Causes and Remedies Listed!